NORTHRIDGE, CA--Industry pioneer John Eargle was posthumously awarded the 2008 Technical GRAMMY Award at the Special Merit Awards ceremony in Los Angeles on the evening prior to the 50th GRAMMY Awards Telecast. The accomplished engineer, musician and longtime JBL Professional consultant passed away May 9, 2007, leaving a legacy of achievement in the areas of music recording, loudspeaker design, and education. The Technical GRAMMY Award is presented by vote of The Recording Academy's National Trustees to individuals who have made contributions of outstanding technical significance to the recording field. 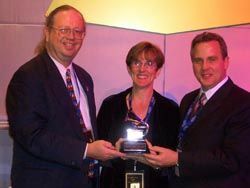 "John Eargle left an everlasting and profound impression on the audio industry," said Mark Gander, Vice President of Marketing, JBL Professional, who accepted the GRAMMY Award on behalf of John Eargle, along with John's niece, Cyndi Bird, and nephew and namesake, John Paul Eargle. "He was a brilliant engineer, musician, author and teacher. His 2008 Technical GRAMMY Award commemorates the industry-wide recognition of John's accomplishments, as well as the considerable time he devoted to sharing his expertise, experience and wisdom."